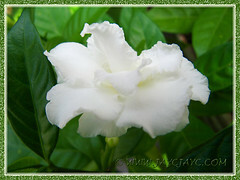 While sourcing for some plants to add to our garden in May 2013, we came across this white beauty that fascinated us so. When informed that it’s a hardy plant that enjoys sunshine, we grabbed two pots without hesitation. These Pinwheel Flower, a dwarf variety were strategically placed at our outer border that gets blasting sun, almost whole day long. 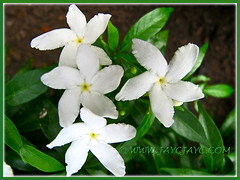 Botanical Name: Tabernaemontana divaricata (Syn. : Tabernaemontana coronaria, Ervatamia divaricata, Ervatamia coronaria). 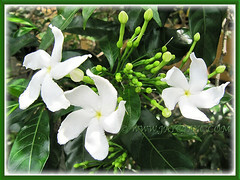 Common Name: Pinwheel Flower, Crepe/Crape Jasmine, Crepe Gardenia, East Indian Rosebay, Nero’s Crown, Milk Flower. Etymology: The genus name, Tabernaemontana is in honour of Jacobus Theodorus Tabernaemontanus, a 16th century botanist and herbalist and accredited the name ‘father of German botany’. The species divaricata means at an obtuse angle, referring to the many branches that grow almost parallel to the ground. Origin: Native to India. Widely cultivated in warm regions worldwide. 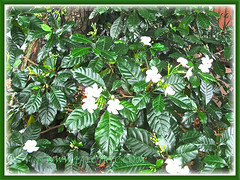 Features: Tabernaemontana divaricata is an attractive species of the genus,Tabernaemontana that consists of about 120 species of flowering plants that has a pan-tropical distribution, found in Asia, Africa, Australia, North and South America and a wide assortment of oceanic islands. An evergreen perennial shrub with moderate growth rate, the Pinwheel Flower can reach 1-4m tall and spread as wide. 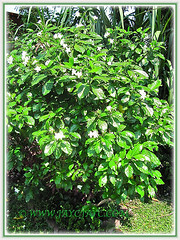 A well-branched shrub with foliage that is dense and dark green, glossy leaves 10-15cm long, oval-shaped with a wavy, simple and entire leaf margin. The opposite leaves are arranged spirally along the stem and have visible veins on the upperside of leaves. 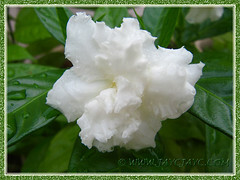 The stems of the Crepe Gardenia bleed a milky sap when injured. The single-petaled and waxy white flowers of the Pinwheel Flower have ruffled edges and are curved like a pinwheel or propeller (hence named such) and has a bright yellow small throat. These flowers are produced in clusters at stem tips and are not fragrant like the cultivar ‘Flore Pleno’. They are about 5cm across. However, the flowers of the dwarf variety is much smaller, about 2.54cm across and leaves are about 3cm long and 1cm wide. The double or clustered flower cultivar Tabernaemontana divaricata cv. Flore Pleno is gorgeous, about 5 cm across with ruffled edges and has a slight fragrance. 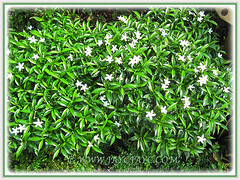 The dark green, shiny leaves are about 15cm long and 3-4cm wide and form a lovely contrast with the pure white clustered flowers. 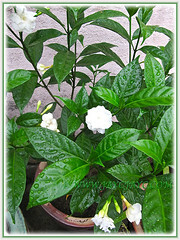 Culture (Care): Tabernaemontana divaricata grows easily with minimum care. Soil: Grow in well-drained acidic soil. However, it’s adaptable to most garden soils such as sandy, clay, and loamy soils. 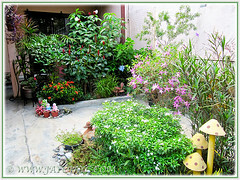 Others: Prune regularly to maintain a round-shaped shrub or a compact form. It tolerate hard pruning well. Feed once monthly with a balanced organic fertiliser. Generally free from serious garden pests. However, do watch out for caterpillars that love feasting on the young shoots. For subtropical and temperate regions: Hardiness: USDA Zone 9-11. 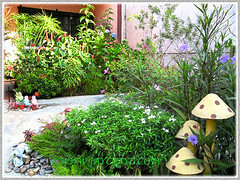 Blooms in Spring but do flower sporadically all year round. In non-hardy zone, grow as a glasshouse plant for its gorgeous flowers and foliage. Some gardeners did confirm that it is a hardy shrub that recovers in Spring from frost and freezing temperatures in Zone 8. However, best to mulch the roots heavily to protect it from severe low winter temperatures. 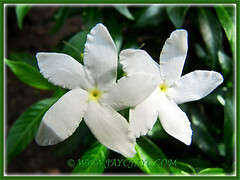 Usage: Tabernaemontana divaricata will be excellent as a showy ornamental plant in any landscape. Its sculptural form and ornamental features will be ideal in shrubbery border or as a specimen planting. Great to plant the Pinwheel Flower as a hedge or ground cover underneath a tree. 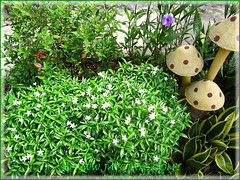 Can be used as a screen and suitable too in container planting or above-ground planter. The scented cluster-flowered cultivar ‘Flore Pleno’ will be most suitable for outdoor living areas such as sunny patio or decks, to enjoy their fragrance in the evening. 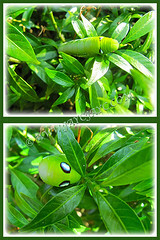 Plant to attract butterflies if you’re a nature lover. I purchased a tree form of the Tabernaemontana divaricate ‘Flore Pleno’ two weeks ago and planted it in a large container on my porch in a place that only gets 2-3 hours of sun. It began to show droopy leaves and stopped flowering so I moved to a full sun location where 2 days late it continues to show droopy leaves. Is there any other reason besides lack of sun light that made it droopy? Will overwatering produce the same effect?